Kit preview of Monsters in Motion's "Athena" . 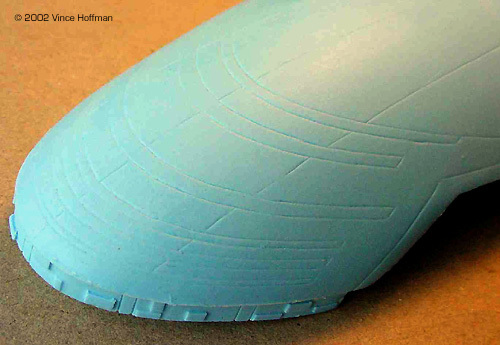 Molding Quality: 8 - Clean and smooth, no bubbles or dimples to be seen. Detail: 7 - Good overall, though scribed lines are sometimes erratic. Overall Rating: An excellent kit for a beginner resin kit builder. The newest addition to the fine collection of Starship Troopers kits currently on the market, this kit will look very nice alongside the Roger Young. The kit, produced by Monsters in Motion, came out of the box very clean, with crisp castings that are completely devoid of air bubbles and mis-aligned mold halves. There is a minor amount of flash on most of the parts which will be easy to clean up. 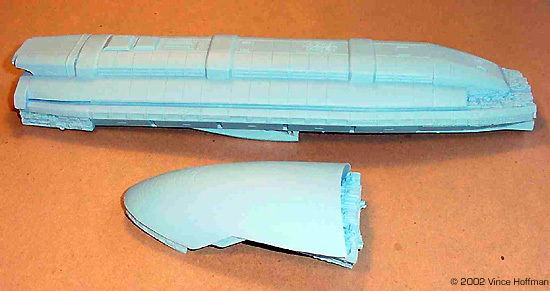 On the larger parts, there is an obvious lack of seam lines, and among the smaller parts, they lay along corners or are hidden from view after the model is constructed. 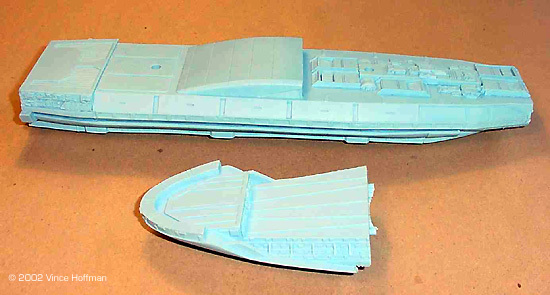 The majority of the parts were cast hollow, and as a result the model weighs considerably less than a comparably sized, solid resin kit. 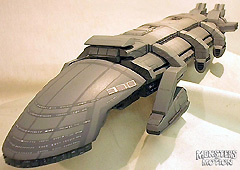 In my opinion, this is a good idea as it will help prevent the model from warping due to its weight. As with most resin kits, there are trials and tribulations. Fortunately with this kit, the problems are few and far between and I have to get nitpicky to spot them. One obvious flaw is a latticework part that attaches to the bottom was cast open-faced and warped badly, and the worse side of the piece will be clearly visible once in place. This piece will have to be replaced with a scratch-built assembly. On the front section, there are some scribed panel lines which appear to have run off the scribing guide. 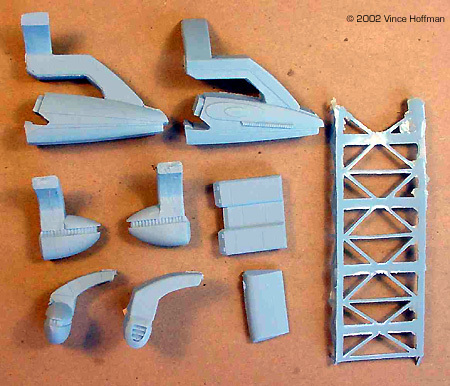 These can be repaired by a small amount of filler and re-scribing to the original panel line location. After putting on a coat of primer paint, some of the flaws have been accentuated - particularly some very crooked scribed panel lines (besides those already mentioned). This is a new kit, not reproduced from a studio model. As a result, some details of the model were left to supposition. 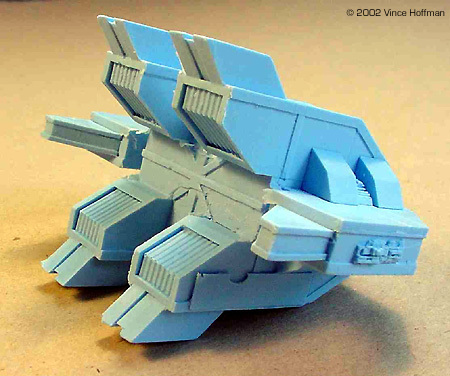 Comparing the model to the screen shot at the end of Starship Troopers, I found that the shape of the foreword "nose" section is 1/3 too long (about 1 ½"/ 3.8cm) and ¼"/ 0.6cm too short. This gives the model a stretched appearance, but does not detract from its clean shape. 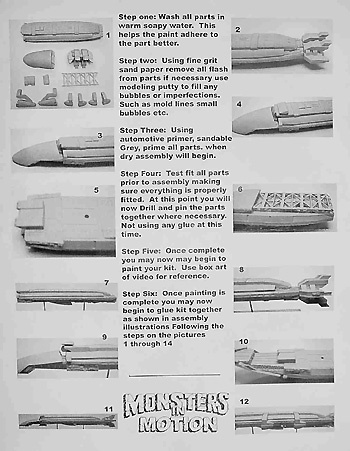 The kit comes with a single page, double-sided instruction sheet with clear black & white photos of the model under construction. 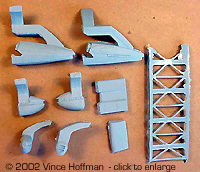 Although the parts are not numbered, it is easy to see where each piece is to go. A painting guide is not included in the kit, but two photos on the instruction sheet show the decal locations. Because of a lack of reference material for this model, painting and weathering is left to the modeler's imagination. Although this is an obscure subject, getting only a few seconds on the screen, I am satisfied with the quality and craftsmanship of this model, and at 19"/ 48.3cm long it will look impressive in my display case. Many thanks to Vince's wallet for providing the review sample. Manufacturers and retailers, interested in getting your wares reviewed and publicized on a site averaging 2000+ readers a day? Contact us! This page copyright © 2002-3 Starship Modeler. First posted 27 June 2002; Last updated on 28 April 2003.